MANCHESTER (Special) Matthew M. Moriarty, local automobile dealer and prominent citizen, was given the Chamber of Commerce's 1964 "M" award at the Chamber's 63rd annual meeting Wednesday at Fiano's Restaurant in Bolton. It was presented to Moriarty by Atty. 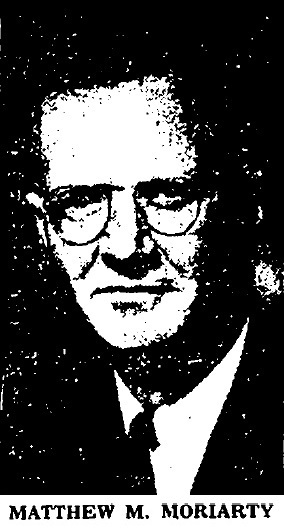 Eugene T. Kelly, immediate past president of the chanber. The "M" award represents the highest single tribute that the chamber can pay to any individual and is made each year to the person making substantial and outstanding contributions to the community. A native of this town, Moriarty left Manchester in 1921 for New York City. There he worked his way through the Pratt Institute and earned a degree in engineering. While attending the institute, he was employed in a bakery and lived in a rented room over it. During the next dozen years he worked and studied in Wisconsin and in New York on various construction projects. In 1933 he returned to Manchester to assist his brother in establishing a new business and never left. On June 22, 1932, he married his grammar school sweetheart, the former Miss Julia Sheridan, and they have five sons and daughters and six grandchildren. Moriarty is past president of the chamber, trustee of Manchester Memorial Hospital, chairman of the citizens' consulting committee responsible for locating the Regional Technical School here a few years ago, a director of the Manchester "Y", a member of the Capitol Region Planning Agency, past president of the Connecticut Automotive Trades Assn. He is a director of the Savings Bank of Manchester, director of the Manchester Savings and Loan Assn., trustee of St. James' Church, a member of the Kiwanis Club, the Holy Family Retreat League, and Campbell Council, KofC; past president of the Lincoln-Mercury Dealers Council of New England, a director and first drive chairman for Manchester's United Fund and a Knight of St. Gregory, which is one of the highest honors which can be stowed upon a layman by the Pope. In presenting Moriarty with the annual chamber award, Atty. Kelly said, "There are many more activities that he (Moriarty) has been engaged in, including being one of the driving forces behind the Little League effort here, and that the good deeds Matt has done number tenfold over the obvious things that have been listed. More than 300 persons, including Gov. Dempsey, attended the 63d annual dinner meeting of the Manchester Chamber of Commerce Wednesday night at the Fiano's Restaurant in Bolton. Addressing the gathering, Gov. Dempsey told the chamber to beware of becoming known as "the organization with the voice that is against." "The best chambers of commerce," the governor said, "are led by men of vision who can see what is good for all the people also is good for business and industry." He said that with the right to speak out against proposals thought to be detrimental goes "an equal obligation to speak out for those things which you regard as good." The governor cited the recent location of a Todd Division plant of the Burroughs Corp. in Tolland as an example of inter-town cooperation. Dempsey said the Connecticut Industrial Building Commission begun last fall, "already has become a major tool in the industrial development task." He noted the commission has already handled 14 approved load applications totaling three quarters of a million dollars and has four others totaling $3 million in process. Governor Dempsey told the meeting, "I am aware of your chamber's interest in, and support for, the proposed urban redevelopment project to be voted on next month by Manchester in referendum." He said that in more than 20 Connecticut towns, "urban renewal has brought life to areas that were largely non-productive. These projects have benefits that range far beyond the immediate area involved and beyond even the community where the redevelopement occurs. "They benefit the economy of the entire state, and I feel that your chamber is serving the interest not only of Manchester but of Connecticut by playing a major role in support of this project," he said. Webmaster's Note: To access the Greater Hartford Chamber of Commerce web page, please click here. Mr. Moriarty's award was presented in 1964.